The purpose of this article is to provide our visitors with step by step procedures for industrial floor cleaning of concrete floor. 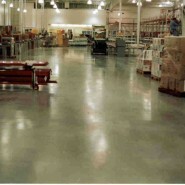 There are several different industrial floor types but concrete makes up the vast majority of industrial floors. Industrial floor cleaning can be difficult because of the heavy greasy soils that are associated with industrial facilities. The heavy traffic such as forklifts, heavy plant equipment and boot traffic from workers can grind these heavy oil based soils deep into the concrete floors. This is true in manufacturing plant but even a Distribution Center facility experiences extreme traffic that will grind dust, dirt soils, industrial fluids, etc. into the floor. A stated above concrete is porous and these soils will penetrate deeply into the concrete pores making industrial floor cleaning a difficult task especially with staining and spots. There are many quality industrial cleaner degreasers on the market. One in particular we discovered recently is the DRIVE-UP Super Cleaner. This product does an incredible job of removing heavy grease and soil and lifts it from the pores of the concrete floor. But as we stated there are many great industrial floor cleaning products that can be purchased through Industrial, and Janitorial supply companies. Place Wet Floor Signs or Barricade around area being cleaned with Caution Tape. If entrance matting is present at the doorways and is removable, unload soil from entrance matting. If not, utilize a dry vacuum procedure to remove the loose soil from the matting. Manual: Broom Sweep the larger loose debris with a push broom designed for concrete. Power Equipment: Many industrial sites have a ride on or walk behind sweeper and some Ride on scrubbers are a combination Sweeper and Scrubber. This is the most efficient and productive way to remove loose debris when industrial floor cleaning large concrete floor area. Manual Cleaning: Damp mop entire floor using cotton mop and bucket method. Use professional grade Industrial Cleaner Degreaser Floor Cleaner according to label directions.Inspect floor after it has dried. Remove wet floor signs after the floor has been thoroughly dry. Power Equipment Cleaning: Mix a professional grade Industrial Low Foaming Cleaner Degreaser Floor Cleaner according to label directions and clear potable water in the automatic scrubber’s solution tank. Using the automatic scrubber (Ride On or Walk Behind) equipped with Concrete Scrub Brushes make one single pass with the automatic scrubber, with concrete floor scrub brushes down, solution valve half-open, squeegee down and vacuum on, pick-up the solution thoroughly. Note: A Low Foaming Cleaner Degreaser is critical because it will not fill the recovery tank with foam which is this happens it will cause the operator to make more frequent trips to empty the recovery tank which decreases productivity and increase labor cost. Inspect floor after it has dried. Remove wet floor signs after the floor has been thoroughly dry.